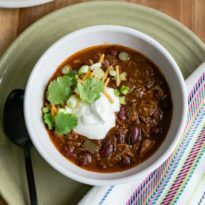 A delicious, easy recipe for Slow Cooker Chili Con Carne. Find all my tips and tricks for adding the most flavor to your chili every step of the way! In a Dutch oven or large stock pot, fry bacon until crisp. Transfer to a plate and crumble when cool. Reserve bacon fat for cooking beef and keep hot. Meanwhile, cut beef into 1-inch to 1 1/2-inch thick steaks. Season each side generously with salt and pepper. Working with one large steak at a time, fry in reserved bacon fat until well-browned on each side. Transfer to a cutting board and repeat with remaining steaks. Cut each browned steak into 1-inch to 2-inch cubes and transfer to slow cooker. Add onion to pot with bacon fat and beef juice. Stir until softened, about 2 to 3 minutes. Transfer to slow cooker. To the slow cooker, add tomatoes with chiles, chicken broth or water, beans, garlic, chili powder, cumin, oregano, chipotle chili powder, thyme, and coriander. Cover and cook on HIGH for 8 to 10 hours. The beef should be falling apart and tender. Strain excess fat off the top if desired. Shred the beef gently with tongs or two forks. Season to taste with salt and pepper and serve with toppings such as sour cream, cheese, scallions, and cilantro. Searing the chuck roast adds more flavor but is COMPLETELY optional. If you decide to skip this step, proceed to Step 2 after seasoning the roast with salt and pepper. Adapted from America's Test Kitchen The Best Simple Recipes 2013 (Quick All-American Chili).